Peterhof palace is a short drive from St. Petersburg, Russia. Situated on the shores of the Gulf of Finland the complex's extensive grounds abound with fountains, statues and pavilions. The array of 140 fountains, the largest such system in existence, are considered amongst the most beautiful in the world. I visited Peterhof on a hot, sunny afternoon in August and really enjoyed wandering around the large complex, making photos as I went. Amplified color contrast (i.e., warm versus cool), through aggressive processing, as a way of further separating the golden statue from the predominantly cooler background. After initial processing in Lightroom I moved the images I planned to publish into Photoshop for a sprinkling of fairy dust and, where required, some more localized treatment. Spectacular golden domes, gleaming on a summer's day, set off a classic Russian church at Peterhof Summer Palace near St. Petersburg, Russia. Peterhof commemorates the expansion and modernization of imperial Russia under Peter the Great, as he stretched his hand out across the Baltic. That’s important for anyone interested in a historical perspective of the site. 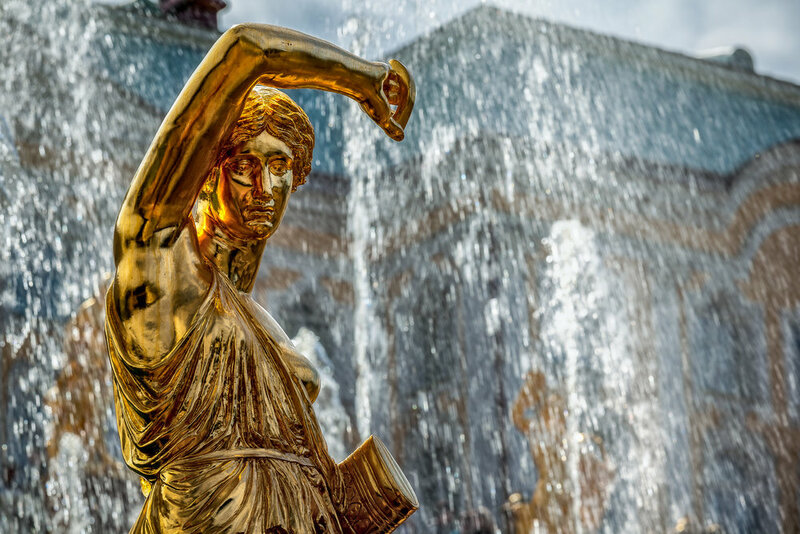 Because of the beautiful buildings and, I suspect, particularly due to the spectacular fountains Peterhof is often referred to as the Russian Versailles. That’s interesting as nearby St. Petersburg is referred to as the Venice of the North, a term that is also used to describe the beautiful medieval city of Bruges (i.e., Brugge) in Belgium. Both cities are built around canals. Peterhof is a lovely place. You'll enjoy the walk around the gardens and the opportunity to photograph the wide variety of architectural elements on display. I'd certainly recommend a visit to Peterhof be included into the itinerary for those planning to travel to the beautiful city of St. Petersburg, Russia. Marly Palace was a lovely, quiet retreat for the former Tzar in the grounds of Peterhof Summer Palace near St. Petersburg, Russia. Just be sure to set aside the best part of the day to make the trip in and out of the city and to wander around this extensive complex. On a long summer's evening there'll be plenty of time for a stroll, or a cruise along the canal, once you're back in St. Petersburg.